Valldemossa is located near Deià in the Serra de Tramuntana mountains and was the most touristy town that we visited in Mallorca outside of Palma. Despite sightseers swarming the area around the town’s most famous landmark, the Royal Charterhouse, it was worth a visit to see the beautiful cobblestone streets and alleys lined with potted plants and vines. 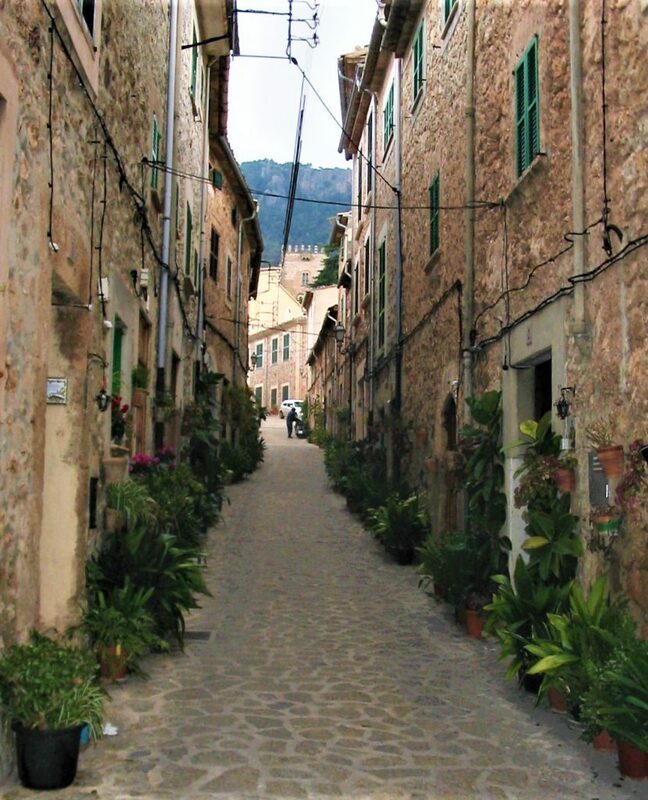 Apart from driving there yourself as we did, there are many day excursions that will take you to Valldemossa from Palma. Alternatively, you can just take a taxi because the direct route is only 17 km from the capital. 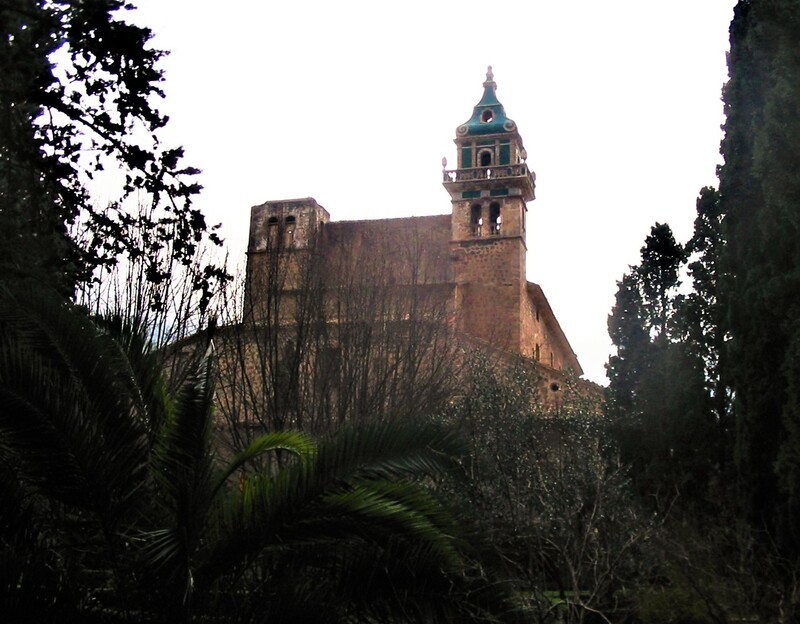 Having begun reading Winter in Mallorca by George Sand at the airport, I was excited to visit Valldemossa where she and Chopin had been holed up for a season, writing and composing, respectively. The new couple had traveled to the island with her children in late 1838 because Chopin had been suffering from a pulmonary ailment and his doctor recommended spending time in a warmer climate. George Sand’s account of the trip details the chilly reception they received from the locals as eccentric artists, their harsh living conditions, a history of their surroundings, and a description of the locals they encountered. Meanwhile, Chopin composed, finished or began, some of his most beloved pieces here. 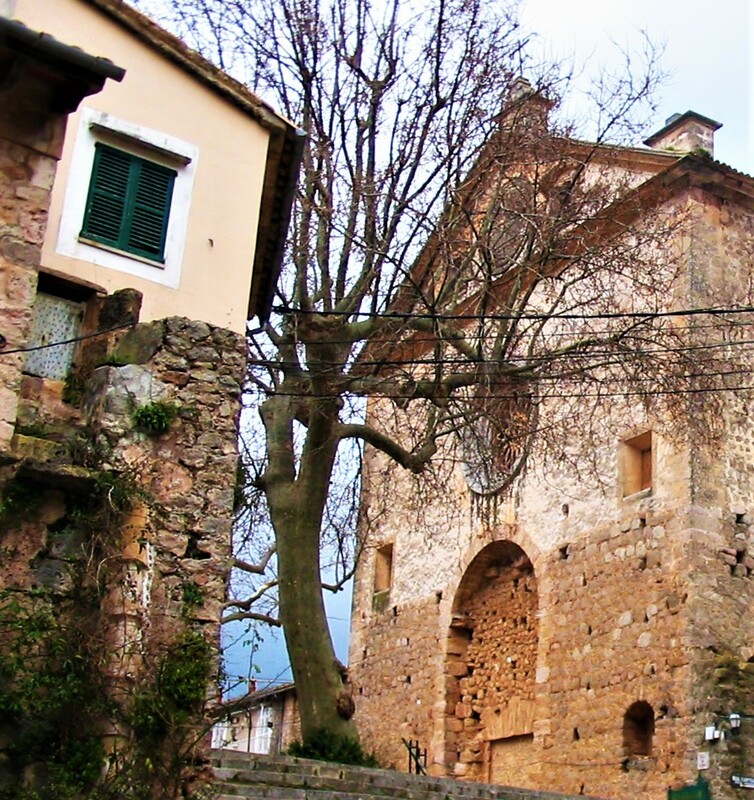 The couple took up residence at the Real Cartuja de Valldemossa, or the Royal Charterhouse, which first served as a royal residence, the Palace of Rei Sanç, and was converted to a Carthusian monastery in the 14th century. The structure is a museum today where you can visit the monastery, remaining palace rooms, and the piano where it is said that Chopin composed during his stay. Wandering around the town was much more satisfying to me than the charterhouse though, partly because the crowds were somewhat jarring after the beautiful, isolated drive to get there. Luckily, the streets and alleys were inviting and less populated, and the stone buildings, all with green doors and shutters and pretty windowsills, made me want to redecorate my house with everything Spanish and rustic. Bakeries, shops, and galleries also lined the streets, and it was the perfect time to grab an ensaïmada, the signature pastry of Mallorca. Ensaïmadas can be found outside of the Balearic Islands, but it is here that they are made with pork lard, saïm meaning pork lard in Catalan and derived from the Arabic term for fat, shahim. Delicious, but steer clear if you have a pork allergy or avoid eating meat. I’m a Meatasaurus, as they say in Jurassic Park, so this was no problem for me. Valldemossa itself is not a coastal town, but there is a small fishing harbor with a restaurant about 7.5 km away from town at Puerto de Valldemossa. The views are absolutely beautiful, so if you have the time, it’s worth the somewhat scary, winding drive. Due to poor planning, I was not able to visit the Costa Nord Cultural Centre, but it is well worth a mention. The project was financed by Michael Douglas, who clearly has a great love of the region. The center has a restaurant, which is the simplest way to enjoy the experience, but there are also tours offered, exhibitions, shows with traditional Mallorcan dance, and a documentary featuring Michael Douglas himself. Kind of bizarre, but sure, why not?